Dwyane Wade scored a season-high 27 points, including a fade-away jumper with 5.9 seconds left, to lead the host Miami Heat past the Philadelphia 76ers 102-101 on Tuesday. Wade came off the bench to score 15 of Miami's final 17 points, including the tough 18-footer over 76ers rookie Ben Simmons. Philadelphia's JJ Redick had a chance for the win but missed a 3-point attempt from the top of the key at the buzzer. It was just Miami's third win in its past 11 games. Joel Embiid led Philadelphia with 23 points, and Dario Saric added 21 points. The 76ers have lost two in a row following a seven-game win streak. Miami's Goran Dragic had 21 points, and Hassan Whiteside had 15 points and a game-high 11 rebounds. LeBron James recorded his 13th triple-double of the season with 31 points, 12 rebounds and 11 assists as Cleveland withstood a stiff challenge from visiting Brooklyn. James shot 13 of 25 and became the 11th player to reach 8,000 career assists. He recorded his 67th career triple-double while helping Cleveland beat the Nets for the 10th straight time at home since April 2, 2013. George Hill added 26 points for Cleveland. D'Angelo Russell scored 25 points to lead the Nets. Kemba Walker scored a game-high 31 points and Charlotte pulled away late in a win over visiting Chicago. The Hornets won their fifth consecutive game, their longest winning streak of the season. Charlotte outscored Chicago 67-52 in the second half to improve to 18-15 at home. Hornets center Dwight Howard finished with 24 points on 10-for-12 shooting. Jeremy Lamb contributed 15 points off the Charlotte bench on 7-for-9 shooting. Zach LaVine led Chicago with 21 points. 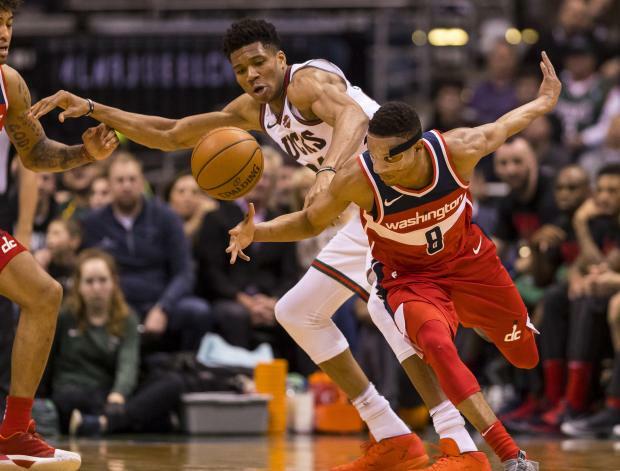 Bradley Beal scored 21 points and Washington held off a furious fourth-quarter comeback attempt in a victory over visiting Milwaukee. Otto Porter hit three 3-pointers and added 17 for the Wizards, who shot 47 percent from the floor. Giannis Antetokounmpo led Milwaukee with 23 points. Jabari Parker finished with 19 off the bench while Khris Middleton and Eric Bledsoe added 17 each. Boban Marjanovic shocked Denver with five of his season-high 18 points in a late tiebreaking run that lifted visiting Los Angeles to a come-from-behind victory. Lou Williams, one of the NBA's leading scorers since Jan. 1, finished with a game-high 25 points and six assists for the Clippers, who have gone 7-2 since trading Blake Griffin. Gary Harris paced the Nuggets with 23 points. Damian Lillard scored 26 points and handed out 12 assists to lead Portland past visiting Sacramento. Shabazz Napier came off the bench for 20 points, and Jusuf Nurkic collected 17 points and nine rebounds for the Trail Blazers, who won their fourth straight game. Zach Randolph scored 20 points and Willie Cauley-Stein contributed 17 points and 10 rebounds for the Kings, who lost for the fifth consecutive time.